Kim Kardashian West hit the 2016 Video Music Awards on Sunday in an understated look that had the internet buzzing. The usually glammed-up Kardashian sister opted for a simple, sheer black mini dress and a subdued beauty look. Her lace-up stiletto sandals and layers of gold necklaces stood out, but a new giant diamond ring stole the show. West debuted a massive rock on her left finger, which, according to People, was a gift from husband Kanye West. If this new emerald-cut diamond looks familiar, it’s because it resembles her 15-carat cushion-cut Lorraine Schwartz engagement ring, which is also set on a slim pavé band. 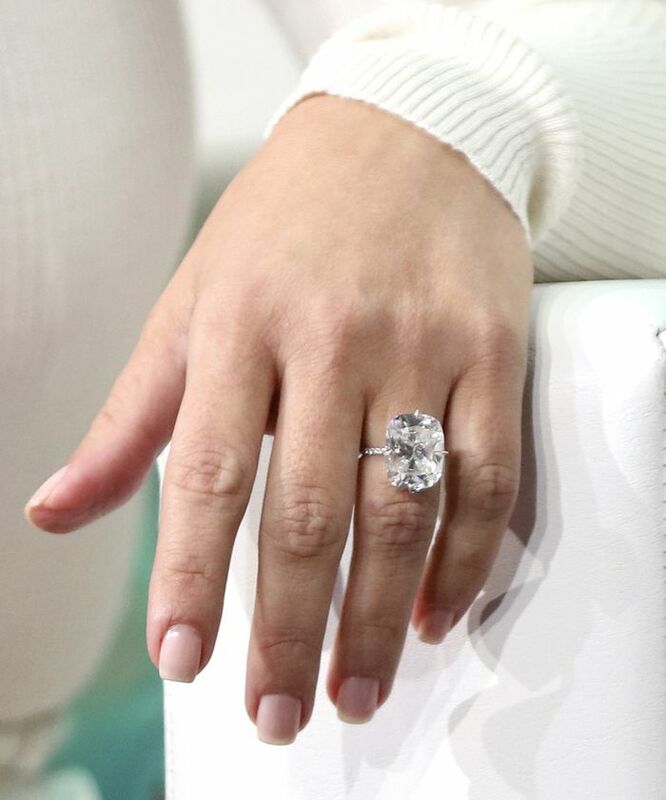 The cut is what sets the two sparklers apart, but they’re both utterly stunning, and People also points out that it appears to be bigger than her multi-carat engagement ring! While we’re still awaiting confirmation of the new ring’s details, one thing is for sure: The entrepreneur loves her double-digit carats when it comes to diamonds. Keep scrolling to see a comparison of her 15-carat engagement ring to her new one! What do you think of West’s new diamond sparkler? Tell us in the comments, and shop affordable simple styles.